Trip Description: Enjoy the unique and unforgettable experience of the world-renowned Thai Village Cultural Show, featuring an impressive cast of 150 performers, portrays captivating scenes of everyday life in rural Thailand. 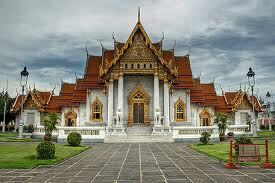 Depart for The Rose Garden, situated on Phetkasem Road, about 32 kms from Bangkok. This garden has an area of about 60 acres and consists of beautiful lawns, small lake, gardens, orchards, first-class hotel , Thai and Chinese-style buildings, famous Thai Village Cultural show e.g. Visit The Thai Village provides a natural and perfect backdrop for the Thai Village Cultural Show. Visitors and guests are presented with a rare opportunity to witness and experience Thai ways in a natural setting. For nature lovers, you are free at leisure to enjoy a leisurely stroll through the Botanical Gardens admiring the impressive diversity of native tropical flora and fauna. Enjoy the unique and unforgettable experience of the world-renowned Thai Village Cultural Show, featuring an impressive cast of 150 performers, portrays captivating scenes of everyday life in rural Thailand and ‘Thai ways’ and offers a vivid introduction to: Thai living, the ‘cycle of life’, time-honoured customs and traditions in an agricultural community in Thailand; the Thai passion for festive fun or ‘sanuk’ and Thai ‘joie de vivre’ – the celebration of a good life and good times, as expressed in the folk songs and dance of the four regions of Thailand. - The magnificent Vichanee Dance from Central Thailand featuring colourful costumes and performed with exquisitely-crafted fans - a ancient court dance performed for royalty in times past. - The boisterous Bamboo Dance from I-San, the northeastern region of Thailand, signifies festivities and camaraderie; it requires tremendous skill, concentration and perfect timing, to perform. 16:00 hrs Depart from Rose Garden to Bangkok. 17:00 hrs At the end of tour will be visit the local product store. Then tranfer to your hotel. Price excluded : Personal expenses, optional tour, tips for driver and etc. Child Policy : Children are 2-11 years old will be charged for child rate. Any child under 2 years old are free of charge. Transportation Policy : Time Start : 07.00 - 12.00 hrs. You can make full payment(cash) directly at our guide upon meeting at the hotel.